Court Date Calculations Made Easy. DocketLaw iOS and Android apps give you the power of rules based calendaring, in a much easier and faster interface. 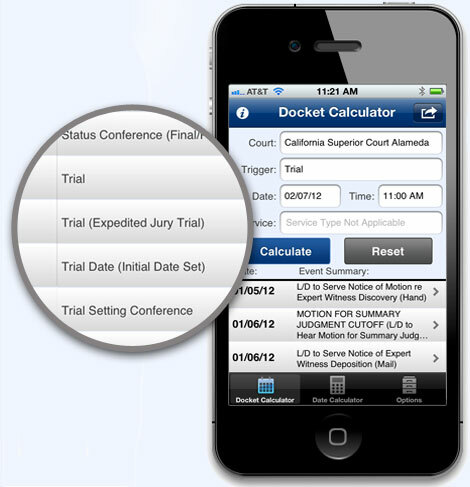 Use the Docket Calculator to calculate deadlines based on court-specific triggering events. Select the trigger and indicate the date and time (e.g. Trial - December 5, 2013 10:00AM). DocketLaw automatically determines and prompts you if the rules calculation is dependant on the service type. 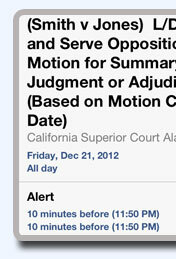 Tap the Calculate button and DocketLaw returns all the deadlines and filing dates. It's that easy. Alternatively, use the Date Calculator feature to simply calculate court or calendar days from a starting date. The Date Calculator automatically adjusts for holidays observed by the specific court you've selected. Over 300 courts and counting. DocketLaw uses the CalendarRules cloud-based engine to ensure court rules and calculation logic are up-to-date and accurate. DocketLaw displays all the events and their due dates based on your trigger event. An Event Detail screen is available for every event, and reveals the due date; calculation logic; and relevant rule text for your reference. 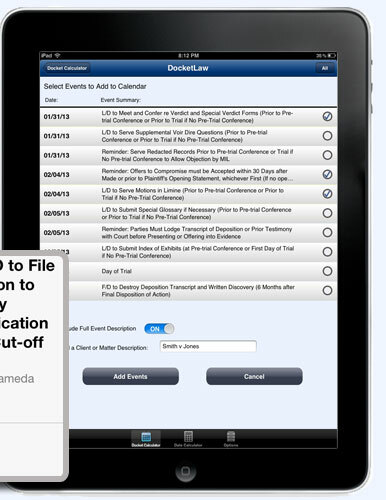 Easily email all the event details or just a summary right through the DocketLaw app without the need to cut and paste. Get Started with a Free 24-hour trial. Create and Manage your Court Calendar. Easily add your calculated deadlines and filing dates directly to your calendar using DocketLaw. Use the native iCal funtionality to set reminders, invite others working on the case, and sync with iCloud or your other calendars. The DocketLaw app also gives you the option to assign a client or matter description, and to email the docket - a convenient way to maintain a dual-record. Sign-up for only the courts you practice in.